The Sepasoft™ Interface for SAP Module extends Business Connector with an SAP® (soon to be certified) interface, adding native connectivity between Ignition® and the world’s most popular ERP system. The Interface for SAP permits calling any Remote-enabled Function Module (RFM) provided by your SAP® installation via a Remote Function Call (RFC) interface. It queries SAP® for any metadata and allows mapping of inputs, outputs, table, and changing parameters. The Interface for SAP queries the SAP® Business Object Repository (BOR) for a list of available Business Application Programming Interfaces (BAPIs), which can be called within Business Connector charts. While no two SAP® installations are alike, the free Quick Start Templates incorporate best-practice workflows for many common use cases like downloading production orders and uploading production confirmations. Start with a pre-built template and customize it for your own SAP® landscape. Outside of user account setup, no configuration is required on the SAP® side for vanilla SAP® installations. The Interface for SAP® leverages SAP®’s RFC protocol to provide high-performance connectivity to SAP® without additional middleware. Synchronous (sRFC), transactional (tRFC), and queued (qRFC) calling methods are all supported, giving you control over synchronous or asynchronous processing, avoiding duplicate messages and ensuring that messages are processed in the correct order. 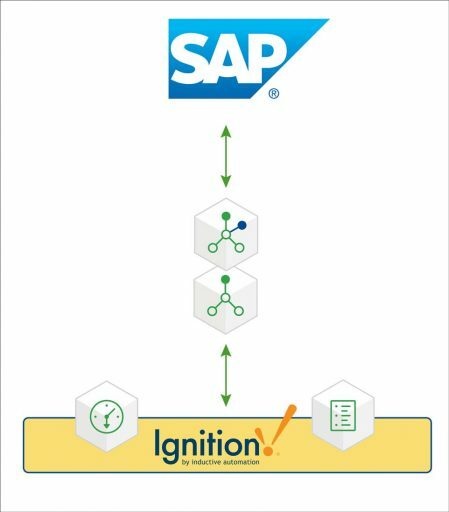 The Interface for SAP Module optimizes communications between Ignition® and SAP®, utilizing techniques like throttling and connection pooling to help avoid network and throughput bottlenecks. The Interface for SAP Module extends the Sepasoft™ Business Connector with new action blocks, turning it into a best-in-class toolset for handling bidirectional communication between Ignition® and SAP®—without additional (and expensive) middleware. The Interface for SAP Module is being certified by SAP® Integration and Certification Center (SAP ICC) to ensure compliance with SAP®. This way, you can be assured that our module has excellent performance and is ready for large-scale, production-ready workloads, reliably handling multiple threads and large quantities of data. An intuitive mapping tool lets you connect and transform data received from SAP® into production data, such as schedules and material definitions, for use by other modules, including OEE, Recipe, and Track & Trace. Built-in support for BAPIs, RFMs, and schemas reduces the learning curve and increases reliability. This increases scalability, simplifies implementation, and reduces the need for high-skill level SAP® experts on your team. Support for queues and transactions offers greater efficiency, freeing up resources for both your SAP® and Ignition® Servers. What’s more, it uses the Business Connector to control the sequence and data mapping of communications between SAP® and other interfaces such as REST and SOAP web services, greatly reducing implementation time and maintenance costs. The Interface for SAP Module installs on Ignition®, the powerful, award-winning, HMI, SCADA, and industrial software platform from Inductive Automation. This module also works seamlessly with our MES Suite, built to help your enterprise align with ISA-95 model standards for integrating enterprise and control systems. By leveraging the full power of Ignition®, the SepasoftTM modules are unlike any other MES offering available on the market.